"That's when my son told me, 'I want to do that,'" Anderson said. Both mother and son have worked as ironworkers on Fermilab experiments throughout their careers. Anderson, known as "Sarge" during business hours and the only female on her crew for decades, began ironworking at CDF — one of two detectors located on the Tevatron ring — when it was "a hole in the ground" in the early 1980s. Anderson and Wicks, rigging superintendent at Joliet Steel & Construction, worked together on the last upgrade of the detector in 2001. "She likes to tease me about it. 'All that work we've put into it, and now you're tearing it apart?'" Wicks said. "During the last upgrade, it was like a football game," Wicks said. "There were so many people watching, you couldn't get a space along the rail to watch us do it." 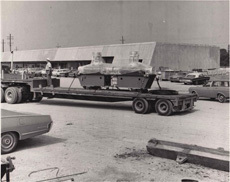 John Wackerlin, a fellow ironworker and foreman at Walbridge, led one of the teams tasked with decommissioning the experiment. Like Wicks, he's laying to rest something his family helped build. 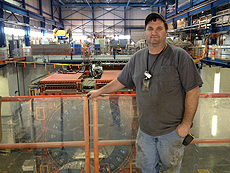 His father, Bob Wackerlin, welded together the structure that houses the 30-foot-tall detector. The elder Wackerlin's work at Fermilab started even before CDF. 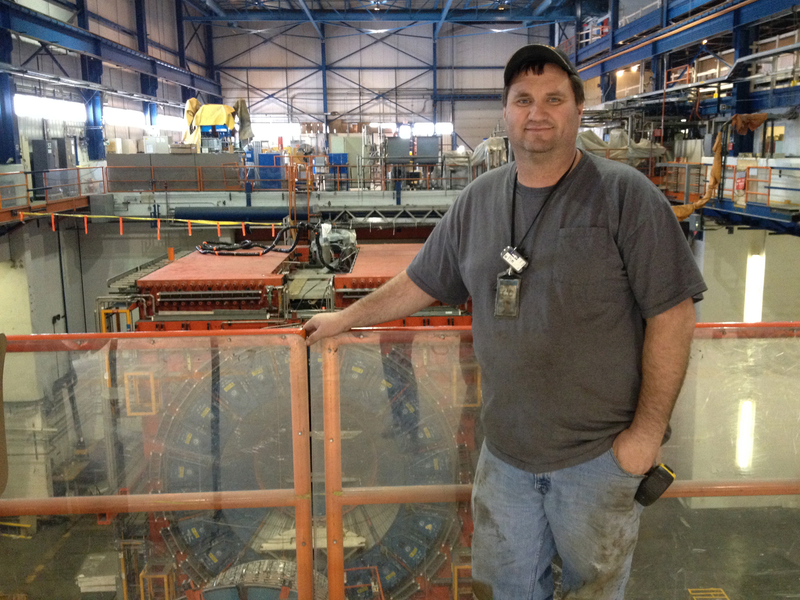 When his wife was pregnant with John, Bob Wackerlin worked underground in the 4-mile Tevatron tunnel while it was still being dug. He retired after 42 years as an ironworker and said he's proud of his family's connection to the laboratory. "I've worked in just about every building on this site," Bob Wackerlin said. "Fermilab projects are some of the best jobs that come across our ironworkers union. It's employed a lot of people over the years." His son added, "Working with physicists and the talent and brainpower here — it's unreal." "Once you've learned something from one experiment, it makes way for new experiments," John Wackerlin said. "So now we can go on to even bigger and better things. I'm excited about it." Editor's note: This article from DESY inForm details a process for polishing superconducting radio-frequency cavities known as centrifugal barrel polishing. The initial work for this environmentally friendly process occurred at KEK. Fermilab's SRF Materials Process R&D Group, led by Charlie Cooper, further refined the polishing process, achieving a mirror-like finish on the cavities' interiors. After this breakthrough, other institutions — Cornell, Jefferson Lab and DESY — demonstrated renewed interest in the process. Usually it's basic research — especially for particle accelerators — that pioneers new technology. But in this case the researchers obviously had a little inspirational snoop at Levi's or any other jeans manufacturer's. Recently, DESY's superconducting TESLA cavities have started to be surface-treated with a stonewashing equipment — accelerators stonewashed, so to say. By most accounts, Hannibal's Rome invasion force in 218 B.C. included 37 or 38 elephants. Nobody knows how he managed to march his army and his elephants over the Alps, but he ended up occupying much of the Roman homeland for many years. Our invasion force into the neutrino empire includes 19 cavities in the Booster — Fermilab's oldest synchrotron, built more than 40 years ago. This week we achieve a great milestone — we will install the 10th of these radio-frequency cavities, which accelerate bunches of protons needed for Fermilab's neutrino experiments. The cavities were originally constructed in the 1960s and installed in the Booster tunnel in the early 1970s. They were never designed to operate at beam intensities requested by proton-hungry neutrino experiments. Fermilab is currently executing a cavity refurbishment program as part of the Proton Improvement Plan project, led by William Pellico (AD) and Robert Zwaska (APC). Refurbishing these 40-year-old accelerator cavities is an involved business. Once a cavity is removed from the Booster tunnel, it's allowed to "cool down" to reduce its radio-activation levels, after which it is disassembled and inspected. The damaged parts are replaced or repaired, and others are cleaned. Then it is reassembled. The final step is to test the cavity at full power and the maximum repetition rate. After that, it is ready for installation in the tunnel. Much like marching an elephant over the Alps (I would imagine), it takes about 10 weeks to refurbish one Booster cavity. It turns out that the Booster needs at least 17 cavities in order to operate reliably, so we are "marching" two elephants at a time. With the installation of cavity number 10, we are halfway over the Alps! Cambridge, Mass. — When scientists jubilantly announced last week that a telescope at the South Pole had detected ripples in space from the very beginning of time, the reverberations went far beyond the potential validation of astronomers' most cherished model of the Big Bang.